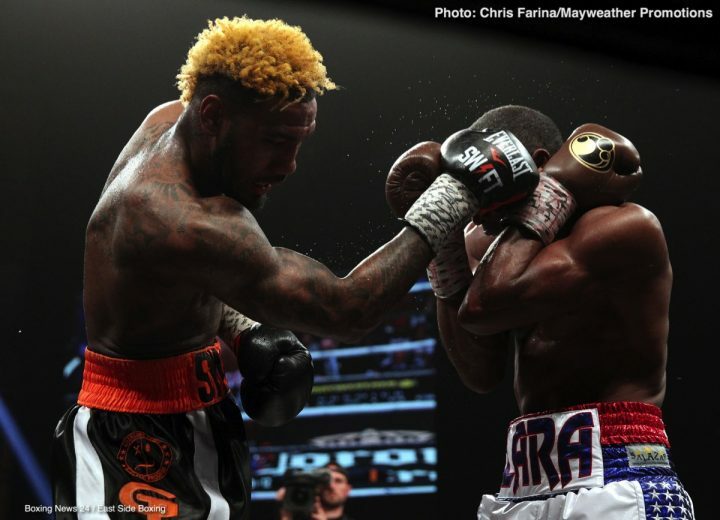 By Jim Dower: Jarrett Hurd states that he had a procedure done on his left shoulder on Monday to repair a problem with rotator cuff. Hurd (22-0, 15 KOs), who holds the IBF/WBA junior middleweight titles, says he suffered the problem while getting ready for his recent unification fight against former WBA Super World junior middleweight champion Erislandy Lara last April, and was taking cortisone shots to decrease the pain. Hurd, 27, defeated Lara by a 12 split decision to capture his WBA title in a close fight. In the 12th, Hurd knocked Lara down and had him close to being knocked out. Although the 35-year-old Lara complained afterwards that he should have been given the victory, few boxing fans agreed with him. The fans overwhelmingly saw Hurd as the better fighter of the two. ”Preparing for the Lara fight, I had a slightly torn rotator cuff in my left shoulder,” Hurd said on his Twitter ”I was receiving cortisone shots to numb the pain but that was only temporary. Now the issue is taking care of. Thank you to everyone that wished me luck on my procedure today. Be back soon,” Hurd said. Fighting a talented guy like Erislandy Lara with a bum shoulder takes a lot of courage. It just shows what Hurd is made of. He didn’t show any signs whatsoever of having a problem with his left shoulder during the 12 round bout. Just imagine what Hurd would have done to Lara if he had been fighting with two healthy shoulders instead of just one. Hurd doesn’t say how long it’ll be before he returns to the ring. He wants to defend against #3 WBA Kell Brook, but he’s not going in his direction. Brook will be next facing Brandon Cook on July 28 in a World Boxing Organization junior middleweight title eliminator at the O2 Arena in London, England. Brook wants to face WBO 154lb champion Jaime Munguia next. Hurd will be taking a fight soon before he looks to face WBC junior middleweight champion Jermell Charlo in a unification fight. The 6’1” Hurd wants to unify the 154lb weight class before moving up to 160 to look to unify that weight division as well. Hurd has the size, power and the chin to compete at 160 and excel against the best. If Hurd beats Jermell at 154, a natural fight at 160 would be against his twin brother Jermall Charlo. Beating both Charlo brothers would turn Hurd into a star overnight, as Jermall is seen as the boogeyman of the 160lb weight class, and the true heir to Gennady Golovkin’s throne. Hurd moving up to middleweight and beating Jermall would pencil him in as the replacement for Golovkin when he steps away from the sport. Saul Canelo Alvarez will need to be dealt with sooner or later by Hurd as well, but he may scare him off if he beats Jermall and Jermell Charlo.